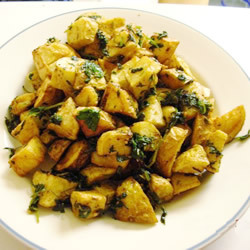 "A yummy Lebanese way of serving potatoes. These go great with chicken or meat." 1.. Heat the oil in a deep-fryer to 375 degrees F (190 degrees C). When the oil is hot, add potatoes, and cook until golden brown, about 8 minutes. Drain on paper towels. 2. Meanwhile, heat the oil in a large skillet over medium heat. Add the cilantro and garlic; cook and stir for about 5 minutes. After draining the potatoes, add them to the skillet along with the cumin, lemon juice and salt. Stir to coat the potatoes, and serve.